“I like this (Big Thrill Factory) because it has a roof over it,” he says, remembering the year the October rains were so heavy that some of Spooky World’s props were swept away and he got a call from the police about “body parts” floating down the icy river. He has two Big Thrill Factories up and entertaining, a pop-up at Canterbury Downs for the horse racing season and is considering additional locations. Because the concept requires around 45,000 square feet indoors and 10,000 to 15,000 outdoors, sites aren’t easy to find. “We get approached a lot (by Realtors),” he says. “There’s a lot of big boxes, but we have to have outdoor space,” plus parking and visibility from the highway. It’s a multi-faceted business, but it’s not even his day job. He still works with Border Foods in its real estate department (formerly in its marketing department). As regional general manager, Darrel Blomberg oversees the operations for two-and-a-half Big Thrill Factories, but he's not a corporate hatchet man. 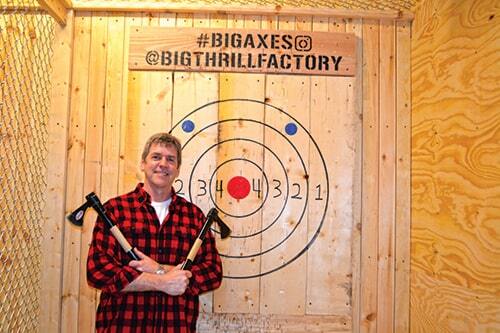 The hatchets are part of the event center's newest attraction, ax throwing. The affable Zelickson sports today’s designer stubble, framing a mischievous smile. He gets his sense of fun and thick Rolodex from his mother, Sue Zelickson, the foodie-philanthropist-food-writer who co-founded the Charlie Awards, and his business acumen from his father, Al Zelickson, a retired doctor who is a savvy investor in the restaurant and real estate spaces. 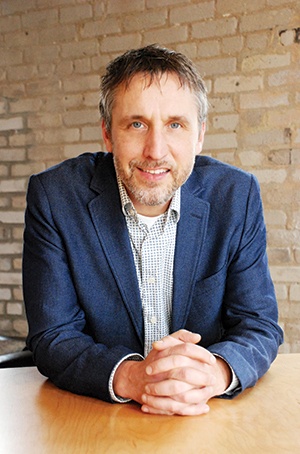 (His mother-in-law, Pat Lindquist, is a longtime restaurant PR maven in the Twin Cities.) He has a law degree, but only uses the skillset for contracts and negotiations. Zelickson claims he went to law school not to become a lawyer, but to avoid his father’s edict after college that if he didn’t hurry up and settle on a career his father would enroll him in barber school. The first Big Thrill Factory opened in an old Kmart in Minnetonka in 2013. Funding came from friends and family, along with a landlord contribution. “I have to give them credit to put in an unknown,” he says, clarifying, “it was (however) vacant for two years.” The second location is in Oakdale, the site of a former Cubs Food. It’s a business with a lot of moving parts, as well as profit centers. In addition to hosting the arcade-style gamers, there are school field trips, corporate team building (think laser tag), birthday parties, bowling and/or go-carts, live magic and comedy shows, and now ax throwing—and let’s not forget the all-important food. Because the space is divided into specific areas, groups can rent out a section of the center while play as usual goes on around them. The only group that bought out the entire facility was AT&T for a Super Bowl event. There are three criteria a game or ride has to meet, Zelickson says, ticking them off on his fingers: One, it has to be challenging; two, it has to be fun to watch others doing it; and three, if you take a selfie with it, his logo shows up in the picture. He grins as he lists the last one, but he’s not kidding. Branding ensures repeat business and in an era of social media, lots of likes. He was ahead of the curve on adding escape rooms. “Who thought being locked in a room with 10 people would be fun?” Zelickson muses. However, its downfall is that it tends to be a one-trick pony. “Once you know the clues it hurts repeat business,” he says. It’s been replaced by ax throwing, a concept he first saw in Texas, and one that has proven to be a surprising hit. Who would think throwing an ax at a wooden target would be fun, not to mention lucrative: $4 for eight throws or $20 an hour. Safety is not a concern here. Because of the way the lanes are set up, “you will have to try to hurt yourself in here,” he says. An “axpert” demonstrates and monitors the action, and throwers are shown a short safety video starring Zelickson’s son, Zack, who coincidentally just graduated from law school. Zelickson’s wife, Lisa, is also involved in the business. She does the bookkeeping and handles the donations and charity requests. A morbid, but funny, touch is a coat rack where the hooks are chopped off plastic fingers. A nod to his Spooky World days. As the son of a foodie, Zelickson understands the importance of having good food, especially when people may not be expecting it. The menu is “treat-yourself food,” such as pizza, hamburgers and cupcakes. A wine and beer license helps keep parents from vetoing an afternoon of watching their kids play games. It also means the event space can host business groups. To that end, he hired Pat Weber of Mise en Place Consulting to come up with the menu. “I don’t have a very developed palate.” Zelickson says, “I like SpaghettiOs.” But taste buds aside, Weber’s skill set includes putting systems in place with detailed instructions so no matter who is making the food it’s foolproof. “Barry had specifics in mind—concession flavor, eat-with-your-hands food. He reached out to a chef, because he wanted good food,” Weber says. “My role is to execute your vision 30 to 60 days after I’m not there. And Weber says he did extensive R&D to make that happen, including a trip to the National Restaurant Show in Chicago, where the two of them tasted all the fried food. “Barry scrutinized everything: Does it fit the model, is it quick, does it taste good?” Weber says. While people aren’t visiting Big Thrill Factory for the dining experience, if there isn’t one, customers are more likely to leave as soon as someone in their party gets hungry. That meant exploded diagrams of how to build the food and cook it and pictures of the final product. One of the first items on Zelickson’s bucket list was a great pretzel, and a really good pizza. ‍‍Pat Weber of Mise en Place, consulted on the upgraded concession food. “People aren’t there to eat, but they’re pleasantly surprised when they do,” he says. For the pizza, “we wanted a stage,” Weber says. “This was when all those choose-your-own-ingredients pizza concepts were opening.” But instead of devoting the space and time it would take to have people choosing ingredients on an assembly line set-up, they decided to go big. 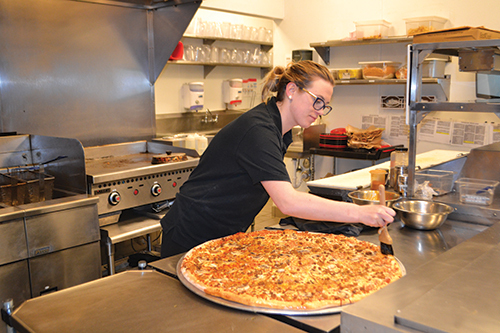 Their pizzas are all hand-tossed, even the 28-inch one. Dough balls are purchased from the Dough Shop in Eagan and proofed on site. “Throwers” are thoroughly trained and there’s a cheat sheet for assembling toppings. We made a second visit to the concession stand the next day just to watch a 28-inch pizza being tossed. Melissa Mettert, kitchen manager at the Minnetonka location, graciously humored us. In addition to tossing a giant circle of dough effortlessly, she prepared macaroni and cheese with bacon, a healthy turkey and avocado sandwich and the less healthy but definitely obligatory cheese curds. And the food did live up to Weber’s charge. “Most people come here with a Chuck E. Cheese’s idea of food,” says general manager, Maria Wuollet, who joined us for the food tasting. US Foods is their distributor, and Wuollet says they use only high-quality ingredients. “Our turkey sandwich is a high food cost, but we make it up on pizza,” she adds. Outside food isn’t allowed in, even for birthday parties, which isn’t always a popular decision. However, because of the volume—“We can easily accommodate 40 birthday parties on a weekend,” Wuollet says—they hold fast to the rule. In case that sounds a bit Scrooge-like, to make walking little Susie’s birthday cake back to the car more palatable, Weber put together a decorating program so kids could embellish their own cupcakes. And who doesn’t like a cupcake with a lot of sprinkles? Just like everyone in the restaurant and retail business, finding good help is a struggle. Big Thrill Factory, however, has an arsenal of perks most places don’t have. “Our tenure is good,” says Blomberg. It’s not unusual for kids to work for them through high school, into college. In addition to food discounts, employees receive points to play the games for free, along with the ability to use their points for family and friends. Talk about being popular! Employees are cross-trained, although the workers in the restaurant tend to be more specialized, Blomberg says. Zelickson’s come a long way since his days at Spooky World—and Spooky World was seeing crowds of 100,000 horror lovers in its final year. After a seven-year run, he closed it in 2001. “Pushing horror after 9-11 was not something the family was proud of,” he says. He auctioned off everything and started working on the future. It’s paid off. Big Thrill Factory was just awarded his industry’s highest honor as Best Family Entertainment Center. And the family couldn’t be more proud.